A recent study by PsychTests.com indicates that top performing employees show ambition, persistence, and a consistent desire to better themselves. Want a top performer? Hire for ambition. "Determining whether you have a future Mount Everest climber on your hands or an underachiever is a matter of asking the right interview questions." What do Mark Cuban, J.K. Rowling, Jim Carrey, and Oprah have in common? They knew that they were destined for greatness and were driven to make something of themselves, no matter how much hard work it required or how many obstacles obstructed their path. 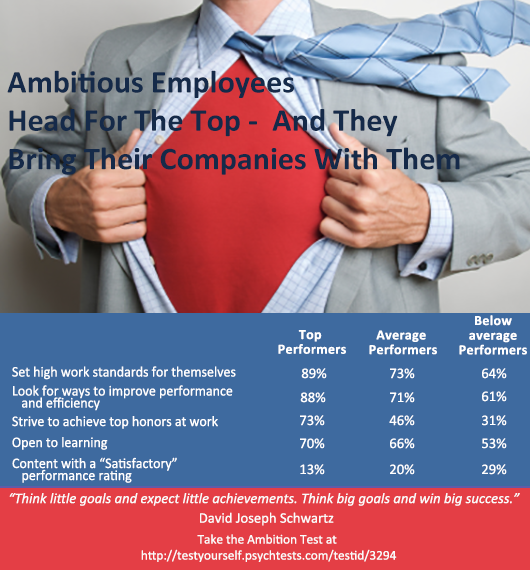 Ambitious people not only challenge the status quo, but as research from PsychTests’ Ambition Test reveals, job candidates with strong aspirations are more likely to become the top performers in a company. Top performers are much more driven (score of 70 on a scale from 0 to 100; 63 for average performers, 56 for below average). They are more likely to have several professional aspirations (score of 76 vs. 65 vs. 61). They are more likely to have several personal aspirations (score of 67 vs. 63 vs. 58). They have a stronger sense of self-efficacy (score of 71 vs. 62 vs. 52). 94% of top performers believe that they can achieve whatever they set their mind to (compared to 75% for average performers and 70% for below average performers). 89% set high work standards for themselves (compared to 73% and 64%). 88% consistently look for ways to improve their performance or complete tasks more efficiently (compared to 71% and 61%). 87% are “very motivated” to improve themselves and become a better person (compared to 77% and 58%). 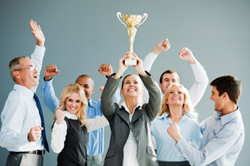 73% strive to achieve top honors at work, like Employee of the Month (compared to 46% and 31%). 70% make it a point to regularly learn new skills, aside from those they learn in school and during job training (compared to 66% and 53%). 58% have a long-term career plan (compared to 47% and 46%). Only 21% of top performers have turned down an opportunity because they didn’t believe they could live up to the challenge it offered (compared to 31% and 49%). Only 13% would be content with a “Satisfactory” job performance rating (compared to 20% and 29%). PsychTests.com is a subsidiary of PsychTests AIM Inc. PsychTests.com is a site that creates an interactive venue for self-exploration with a healthy dose of fun. The site offers a full range of professional-quality, scientifically validated psychological assessments that empower people to grow and reach their real potential through insightful feedback and detailed, custom-tailored analysis. Superstar employees don't settle for "Satisfactory." They strive to do and be more.Job candidates with strong aspirations are more likely to become the top performers in a company.